Victor Joseph Crepeau (1922-2007) enlisted in the U.S. Army Air Corps 1941 after graduating from Mt Carmel High School and attending college for one year. When he enlisted his “civil occupation” was in the “Actors and actresses” category. [The photograph below carries the U.S. Army Signal Corps watermark because the Signal Corps took the photograph.] Someone wrote “Vic” on the back of one of the photographs of him, so I’ll call him by that name. Vic survived a crash landing on 2 February 1944 when the B-24J he and a crew were ferrying crashed near Barnstaple, North Devon, England. They got lost in bad weather and ran low on fuel. Vic, a 2nd lieutenant, was the co-pilot. The pilot, 1st Lt Edward M. Coverdill, and navigator, Sgt George R. Kiefer, also survived. Six other crew members were killed. Vic commanded 50 Airlift Squadron from Aug 1961 to Jan 1963. In May 1968 Maj Gen Ernest Hardin, deputy chief of staff for operations, Tactical Air Command, presented Vic with the Bronze Star Medal for “meritorious service against Viet Cong forces” and the Air Medal for “outstanding airmanship and courage on successful missions under extremely hazardous conditions”. Vic retired from the USAF as a lieutenant colonel (O-5) in 1970. When he died Vic was buried at Arlington National Cemetery with full military honors. Vic spent a lot of time at what is now King Abdulaziz Air Base in Saudi Arabia. Most of the photographs I’ll be posting in the coming weeks were made while he was operating out of that location. Before 1945 it was called Dhahran Airfield as shown in the below photograph of some presumably airfield employees. The USAF operated the airfield from 1945 until 1962. They put the new name on a new sign. Here is Vic with two unidentified colleagues. They are wearing Air Transport Command patches which dates this photograph to pre-1 June 1948. Vic and the officer to his left wear pilots wings over their left breast pockets. I presume the below photographs show Vic in his office at the airfield. Judging by the style of Arabic script, the below photograph was taken in Iran or Pakistan. The logo to Vic’s left is that of Phillips. The words in Arabic script below the logo spell out “Phillips Radio” in English, a name which was used by the company in the 1910’s. I suspect the interesting thing about the photo was the Arabic script and the Phillips logo. The next three photographs below were taken in Iran. The first one has “Teheran Hotel” written on the back and the other two have “Teheran” written on the back. The movie “White Cargo” came out in the U.S. in 1942. The next four were taken in Pakistan and have “Karachi” written on the back, the first one has the additional identification, “Main Street”. Vic was deployed to, or stationed in Asmara, Eritrea. The reason I suspect he might have been stationed there is that many of his Asmara photos have a stamp on the back indicating the photos were developed there. In this first photo he is a captain (O-3). This photo is of the Grand Mosque of Asmara. Vic wrote “the mosque Asmara” on the back. And, presumably, the B-17 itself. The following two photographs possibly depict Kagnew Station, though I was unable to prove so. One of them has the Asmara stamp on the back. A couple of other photos were quite interesting. 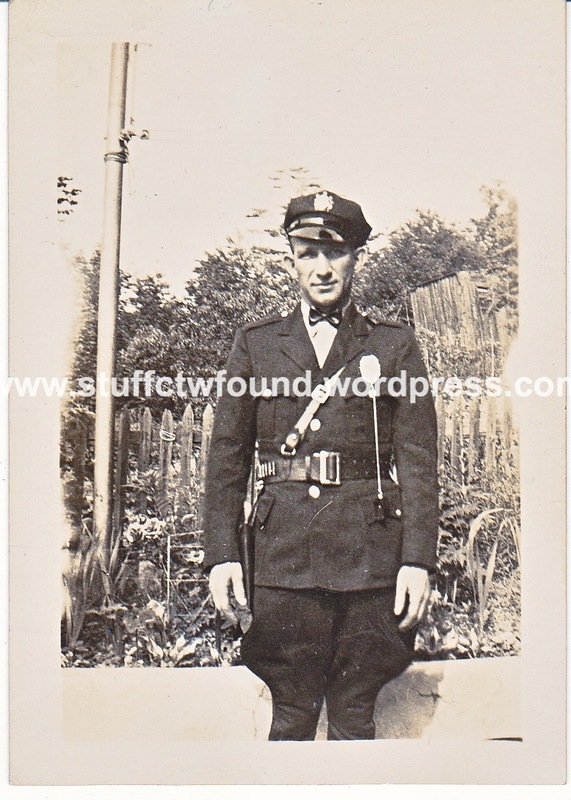 Here is on of Vic and three U.S. Army enlisted men. I think they are posing with a C-47. “CBI” on the door stands for China-Burma-India, connecting this aircraft to the India-China Division of the Air Transport Command. 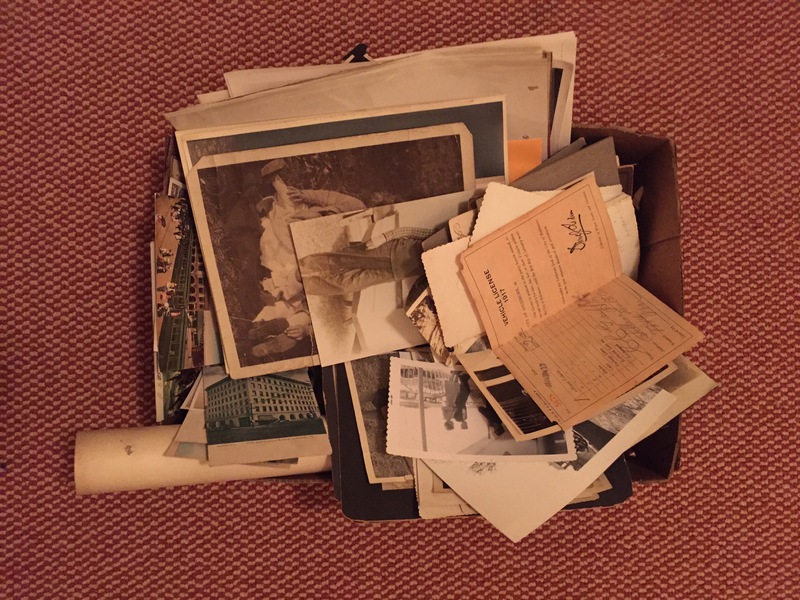 All these factors would date this photo between 1942-1946. I was unable to further identify the symbol . The following photograph has the Asmara stamp on the back (Foto Stampe Voghti, Asmara), along with Vic’s helpful commentary: Some of our civilian help being taken to Asmara in one of our aircraft. As you can see our planes are not “plush”. This appears to be a C-47. Finally, the following photograph shows an aircraft with the tail number visible: 49135. According to online records, tail number 49135 was a C-57. There was no further information on the aircraft. UPDATE, 2 June 2016: Tony Cassidy, an Irish historian who wrote “From a Rock to a Hard Place” about the crash which killed U. S. Consul General George Dailey Henderson, informed as follows: 44-9135 (tail # displayed as 49135) was a late-model Douglas C-54E-15-50 construction # 27360 delivered 23 May 1945 to the USAAF and nothing more was known (until your photographs show it to have gone to Air Transport Command). These photographs and dozens more were purchased in February 2016 from an antique store in Baltimore. Next up from Vic’s photos, “The Crown Prince’s Visit”. 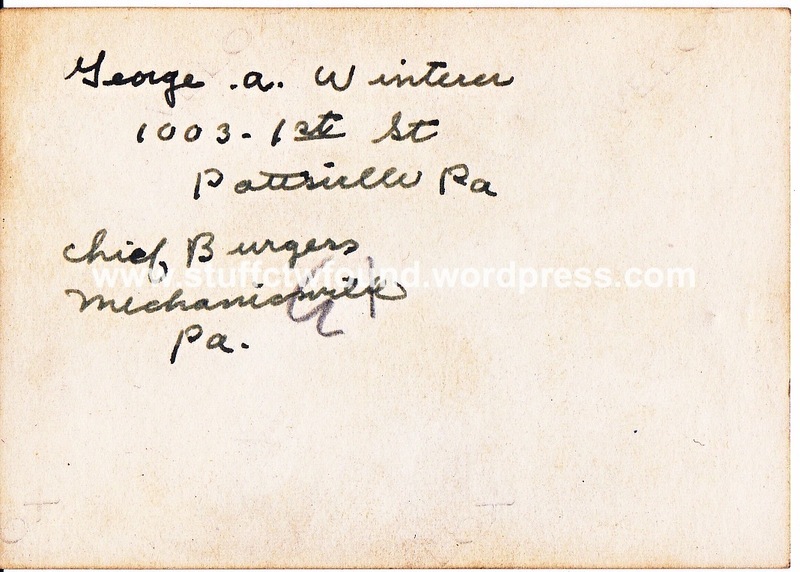 George Albert Winterer (1900-1960) of Pottsville, PA was Chief Burgess of Mechanicsville, PA. He was the son of Joseph Winterer (1868-1924) and Sarah J. Eyler (1871-1955). The three of them are buried in Charles Baber Cemetery in Pottsville. He married Eva Irene Weiss in 1922 and they had one son, George Allan Winterer (1924-1974). They were still married in 1935 but by 1940 George was divorced and, along with his son, living with his widowed mother. In the late 1930’s he married Elizabeth Katcher and they remained married until his death. The photo is 2.5″ X 3.5″. I purchased it at an antique store in Baltimore, MD, in January 2016. ***Update on 28 March 2016*** A niece of George’s saw the blog and contacted me. I sent her the photograph on 1 March 2016.